One of a Kind Stone Free Shipping. Malachite is found in Australia, Chile, France, Mexico, Morocco, Nambia, the southwestern USA, and Zaire. On the Mohs scale of hardness, it is a 3.5 to 4, a relatively soft stone. The colors are a combination of intense blue with green inclusions. 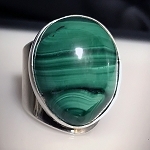 Malachite promotes growth and builds up strength. It helps ease heart pain, as well as promotes understanding and spirituality.